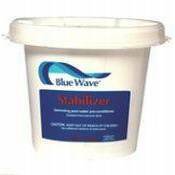 Stabilizer & Water Conditioner - 2lbs. Reduces chlorine loss caused by the sun's ultra-violet rays. Consisting of 100% Cyanuric Acid this product should be broadcast into your pool. Fast dissolving. Dosage rates vary based upon pool volume and current stabilizer level. Minimum recommended level is at least 50 ppm, but no more than 150 ppm. Orders in by 12 noon will ship the same day!